About: Jean Faucheur was born in 1956 in Paris, city where he lives and works. Graduated from l’Ecole Nationale des Arts Décoratifs in Paris, early he became a pioneer of urban art in France with his taste for rupture, and acute sense of sharing. Armed with a solid classical education, he soon got the intuition that museums’ walls should be brought down and, since 1983, he covered commercial billboards with his own paintings in order to hijack their function and showcase his artworks to the public. Faucheur became one of the first artists in France who left the studio to put his art out in the streets. Faucheur started covering the streets with around 120 artworks of 3×4 meters. His most recognizable method is the cutting out, weaving and rearranging images that are assembled together to form a unique piece of art. He ended up receiving an invitation to display his artwork on the streets of New York City with the Tony Shafrazy Gallery, famous house of works by Keith Haring, Futura 2000 and Basquiat. Over the next 15 years, this innovator dedicated himself to sculpting, painting and photography. Finally in 2002, after his meeting with artist Thom Thom, Jean Faucheur re-engages with the street art scene co-founding Le M.U.R., the first association of its kind, an emblematic urban art spot in Paris. Where you can see it: New York, Los Angeles, Paris, Lyon, Brussels, Lausanne, and more. 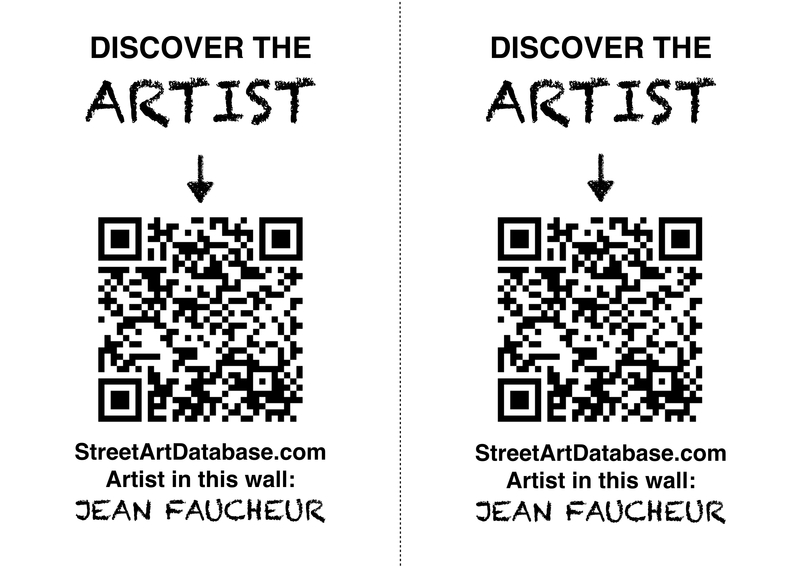 PRINT CODE: help tagging Jean Faucheur in the streets of your city! Posted in graffiti, murals, poster wheatpastingBookmark the permalink.